Meet our Marketing Maven, Siobhan Baumber. Siobhan has been with HiRUM for just over a year now and is a recent graduate of the University of Queensland, with a double degree in both Finance and Marketing. She is enjoying being in the workforce and loving being able to put theory into practice. When Siobhan isn’t busy bringing our events together, she is working to bring you the latest information from both HiRUM and the industry at large. She is most definitely a critical cog in our Marketing engine! Studying in Canada! I completed my last semester of university on exchange in Montreal. I was hoping to be fluent in French within the 6 months that I was on exchange. It turns out learning a 2nd language isn’t as easy as I’d thought…I’m still practicing though. Organising the HiRUM Anywhere Launch events last year was definitely a highlight. I have a new found respect for event organisers – now that I know how strenuous it can be. In saying this, nothing beats receiving positive feedback on articles I’ve written. A lot of time and effort goes into creating engaging and valuable content for our clients, so I love hearing that it’s appreciated. Make the most of the expansive eLearning materials that HiRUM has available. I’m constantly astounded by the amount of effort that goes into making all the materials clients can use to make the most of our powerful software. Including interactive help sheets for the HiRUM Anywhere apps! Go for a run with my dog. She’s a border collie and she was born on a farm, so her herding instincts are next level. My partner and I run with her regularly, and she has a great time rounding us up every time we change direction. Without a doubt, Japanese! Spicy ramen & agedashi tofu are probably my favourite dishes. Literally? I think the thing I’d struggle without most would be access to clean drinking water (duh). But seriously, I think water is very important for health & wellbeing, and I’m also not a fan of the bottled water industry at all. After travelling to countries where the only safe water available is out of an overpriced, environmentally destructive bottle, I realised we have it pretty darn good in Australia, and it shouldn’t be taken for granted. Just one of the things I love about this country! This is a hard one…I love travel so much! If I had to pick one place though, it’d be Zion National Park in Utah, USA. I recently spent just one day there, with my partner, on a road trip we did from San Francisco to Las Vegas. The valley is just mesmerising at both sunrise and sunset, and is full of challenging hikes leading to equally rewarding views. 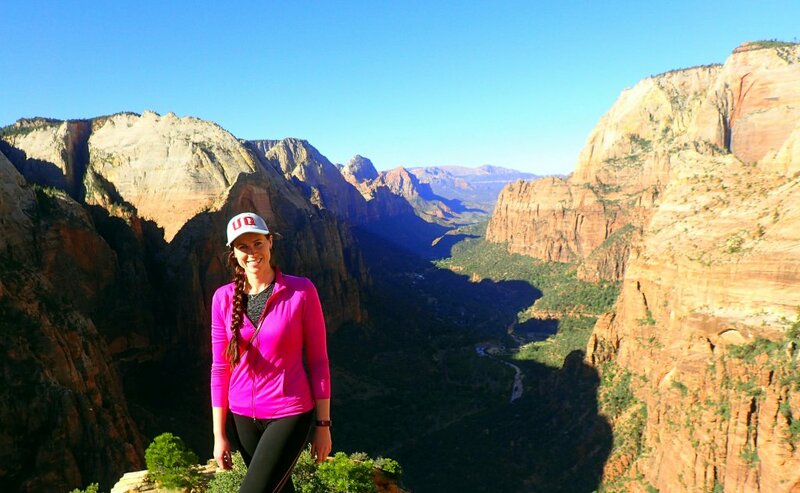 My favourite was definitely the Angel’s Landing hike (pictured above). I was in a number of bands in high school…a rock band, a heavy metal band, an indie-country-folk band (called Eljae), an acoustic band, a jazz band and the school’s concert band. I played bass guitar and piano, and was a major music geek! Eljae won a recording contract with a local label at the end of our last year. Unfortunately, after only recording one of our songs, the label went bust – obviously they’d been giving out too many free contracts!